Looks aren’t everything, but try telling that to someone who has always smiled with his or her mouth closed because of imperfect teeth. Your emotional health is just as important as your physical health, and worrying about exposing your unattractive smile while speaking prevents you from living your life to the fullest. In Gulf Breeze, cosmetic dentists Dr. Paul Quinlan and Dr. Gina Gomez are passionate about helping you achieve not only a fully functional bite but also the carefree feeling that comes with a great-looking smile you're proud to show the world. At Santa Rosa Family Dentistry, our goal is to help you look and feel better when you leave our office, and we can attain that goal with quality cosmetic dentistry. • Composite Fillings: Using a putty-like material that matches the coloration of your tooth, we can fill cavities and cracks to restore your tooth to its former shape. We then harden the composite resin and polish it until it is indistinguishable from your natural tooth structure. • Crowns: Porcelain crowns are made of luminous ceramic materials that reflect light like real teeth. Crowns cover the whole tooth and are used to repair large areas of decay, worn-down teeth, and large breaks. • Inlays and Onlays: To help you avoid losing too much healthy tooth structure for crown placement, some large areas of decay can be treated with inlays or onlays, which are hard fillings made of porcelain that are bonded to teeth. • Cosmetic Bonding: Dental bonding employs the same composite resin that is used for fillings. This versatile material can cover the entire front part of a tooth or just a portion of it to alter its color, size, shape or position. When hardened and polished, bonding shines like tooth enamel. • Porcelain Veneers: Also called porcelain laminates, veneers cover the front surfaces of teeth. These thin shells can address the same types of cosmetic issues as dental bonding, but they last longer and look more natural. • Fixed Bridges: To replace a missing tooth, our Gulf Breeze dentists can place a bridge, which is composed of one or more replacement teeth attached to a porcelain crown on either end. The crowns are placed on the teeth adjacent to the gap to restore your beautiful smile. We offer chairside teeth whitening in Gulf Breeze, but many patients prefer the ease of whitening at home with the KOR system. The first step is allowing us to create comfortable whitening trays that fit your teeth perfectly. We will send you home with the trays, which you will fill with whitening gel and wear while you sleep at night for two weeks. When treatment is complete, your teeth will be an average of 16 shades whiter. The KOR bleaching formula is less likely than other professional whiteners to make your teeth sensitive. 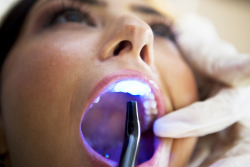 With periodic touch-up treatments, you’ll maintain your teeth whitening results for life. If you’re embarrassed about the appearance of your smile, do not hesitate to contact us if you would like to schedule a cosmetic dental consultation. At Santa Rosa Family Dentistry, our compassionate team of dental professionals has seen it all, and we take great pleasure in transforming the smiles of our patients and improving their quality of life with gentle cosmetic dentistry treatments.